Trident Technical College’s Dental Hygiene and Dental Assisting students participated in Kid’s Fair ’98 at the Gaillard Auditorium in Charleston, SC on March 29, 1998. This annual event is sponsored by the professional organizations and businesses and drew approximately 12,000 kids plus their parents this year. Students gave oral health education including toothbrushes, pamphlets on brushing, flossing, bottle mouth syndrome in babies, etc. A real highlight was the promotion of an alternative to the use of spit tobacco by giving Mint Snuff All Mint Chew to those who were tobacco users. The students provided information on the dangers of tobacco use and possible consequences to oral and systemic health. They had resources on cessation techniques available. A more positive response to consideration of stopping snuff or chew has been noted with the Mint Snuff alternative. The students reach a broad range of the population of the Low Country through their dental health presentations: to schools and all grade levels, sports teams, boy scout/girl scout groups, church health fairs, nursing homes and various clinics treating radiation, bulimia, etc. A focus this year has been tobacco cessation and possible alternatives to the use of tobacco products. 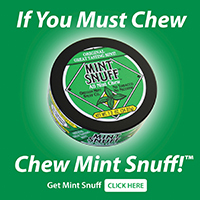 The Mint Snuff products have been a positive reinforcement in cessation. The curriculum includes tobacco education primarily in the Pathology course with reinforcement in Periodontology and clinic. Each clinic patient answers a health questionnaire which includes questions on tobacco use. The dental hygiene students are urged to respond to all affirmative tobacco users with education/information on tobacco effects and cessation methods.